The final round of Cricket against Brisbane Grammar School saw only 3 completed fixtures in Toowoomba, while a result was possible in most of the remaining matches played at BGS’ Northgate grounds. Overall, TGS won 5 out of 13 completed fixtures, which included another victory for our undefeated 8C side. Our 1st XI were also victorious in a match which resulted in a 4th place finish for the season, a great achievement. Across all GPS fixtures in 2019, TGS had a winning percentage of 59.85 which is up almost 10% on 2018. The penultimate round against Churchie was another wet day of Cricket which saw 9 cancellations across our GPS fixtures. Of the 14 matches in the senior school that proceeded, TGS were victorious in 12 – a cracking result. In more good news, our 1st XI bounced back following two consecutive losses and earned themselves a bonus point in their 6 wicket victory against their East Brisbane opposition. An early morning inspection of grounds around Toowoomba (and at BBC) unfortunately saw 13 games cancelled for our Round 7 contest with Brisbane Boys’ College. This meant only 13 GPS fixtures were contested on Saturday with BBC winning the day 7 -6. TGS were victorious in 2/3 supplementary fixtures played against Brisbane Grammar School. Given the likelihood of rain over the next 24 hours please ensure you visit the Fixture page of the SAA website for up to date cancellations before you depart for buses/grounds tomorrow morning. A call on the morning games will be made at 5:30am. Please allow time for updates to be made to this page. Please also ensure that whilst we want to be playing as much Cricket as possible, the safety of all players is paramount. Fingers crossed for some reasonable weather. Please be advised of the following details for the upcoming TGS Cricket Presentation Day. This is a great way to gather as one to celebrate another successful Cricket season at TGS. Each team will be presented with Best Bowler, Best Batsman and Most Valuable Player awards. FYI – Year 7 Cricketers will be on camp and will be presented with their awards whilst at Alexandra Headland. Our much anticipated round 6 clash with Brisbane State High School returned 12 wins and 5 losses which included some mixed performances. Our Year 10 and Year 11 sides were undefeated against BSHS, while our younger grades were outplayed by State High’s extremely strong and undefeated 7A, 7B and 8A sides. Unfortunately after a clinical day out against NC 7 days prior, the 1st XI lost by 5 wickets in what was a disappointing performance. After a week of uncertain weather, it was a tough round of Cricket against The Southport School. 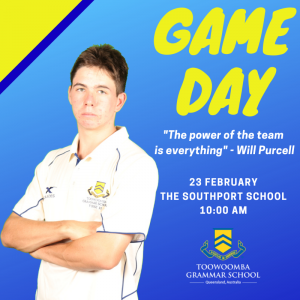 Playing against TSS means an extremely early start for those playing away, and after a 2 hour plus bus ride, it’s quite often difficult to switch over to Cricket mode. This proved a challenge as the majority of games played were won by the team playing at their home venue.